PERHAPS Graham Wood watched Corrie instead. Unwell, the Gateshead chairman was not at the International Stadium last night, when his club served further notice of how far they have come in recent times by appearing on live television. On the pitch, progress – and there has been plenty of late – was less forthcoming. Unbeaten in five Blue Square Bet Premier and FA Trophy games and having fared relatively well against the division’s big boys this season, the Tynesiders faced their screen test with confidence. AFC Wimbledon had won just once in seven, after all. But shorn of the suspended Ben Clark, the hosts only started and ended the first half well. Otherwise, they were second best and struggled to make an impression. At least they began with promise. Inside six minutes Gary Mulligan’s cross from the right was mis-hit by Jóan Símun Edmundsson, but Kris Gate’s follow-up effort appeared to be goalbound until Gareth Gwillim deflected behind. After a quarter of an hour Edmundsson squeezed a shot at Dons goalkeeper Seb Brown, and moments later Jon Shaw’s header was well claimed by Brown low to his left. It was encouraging stuff, but would peter out as the visitors began to find their feet. When they did, they almost scored. On 24 minutes Gwillim’s cross from deep was volleyed against the inside of the post by James Mulley. The ball bobbled across the face of goal, yet faced with an empty net Danny Kedwell’s shot was somehow brilliantly blocked by James Curtis. As Wimbledon continued to increase their control on the middle stages of the half, Mulley pulled a shot wide following a corner and Rashid Yussuf fired directly at Tim Deasy. But in turn, their command would not last either, as the pendulum swung back in Gateshead’s favour for the final 15 minutes before half-time. Yet another fine cross from Mulligan was nodded by Shaw to Edmundsson, who ought to have done better but drilled straight at Brown. From a Phil Turnbull cross, Curtis, too, should have fared better but headed over, Shaw blasted off Brown’s legs and Martin Brittain’s free-kick darted narrowly over. Alas, the Tynesiders’ renewed momentum would not survive the break, and within two minutes of the restart Wimbledon were ahead. Edging in from the right, Christian Jolley forced Curtis to back off, and back off, before smashing a low, left-foot effort inside Deasy’s near post. Inside a further two minutes it might well have been 3-0. Kedwell’s low cross was stabbed at goal from inches out by Mulley, only for Deasy to save from point-blank range, and seconds later, after the Gateshead goalkeeper only half-cleared a cross, Steven Gregory somehow contrived to blaze over an open goal. 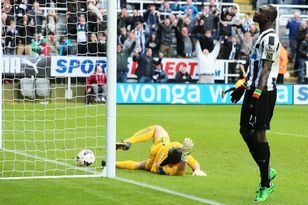 The home side were still in it, and were almost back on terms when Mulligan headed a Brittain free-kick at Brown and Curtis narrowly failed to connect with another set-piece from the former Newcastle United youth star. Later, Brown spilled a Brittain free-kick but recovered well to block Shaw’s follow-up. By then though, Gateshead had shot themselves in the foot. With 13 minutes to go, Ryan Jackson’s cross was intercepted by Curtis, but when the ball bobbled to Deasy, who picked it up, referee Richard West deemed it a backpass, and from the edge of the six-yard box Kedwell blasted the resulting free-kick into a crowded net. GATESHEAD: Deasy, Tavernier, Curtis, Jones, Liddle, Brittain, Gate, Edmundsson (Nelthorpe 73), Turnbull, Shaw, Mulligan (Fisher 73). Subs (not used): Farman, Baxter, Gillies. AFC WIMBLEDON: Seb Brown, Hatton, Stuart, Yakubu, Gwillim, Yussuff (Franks 82), Mulley, Gregory, Jolley, Kedwell (Nwokeji 88), Luke Moore (Jackson 56). Subs (not used): Turner. Goals: Jolley 48, Kedwell 78. Attendance: 922. Referee: R West (Beverley). GATESHEAD rewrote the history books at a volatile Racecourse Ground when they inflicted the heaviest home defeat in Wrexham's proud 138-year existence. THE bond between Gateshead and Hampton & Richmond Borough is strong, but Ian Bogie insists good relations go out the window at three o’clock this afternoon.